Remember that you can track where the core Infinispan team will be making public appearances on the Infinispan Talks calendar! So, see you in Antwerp! 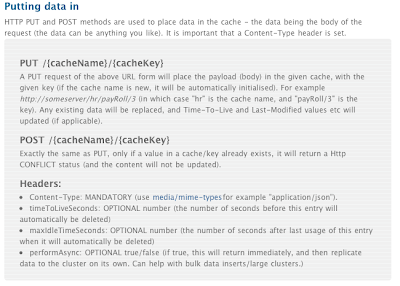 Chris Wilk has posted a detailed blog comparing features in JBoss Cache, Infinispan and Gigaspaces. and is a good starting point for more in-depth analysis and comparison. 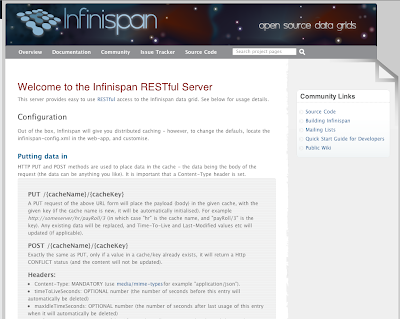 Introducing the Infinispan RESTful server ! The Infinispan RESTful server combines the whole grain goodness of RESTEasy (JAX-RS, or JSR-311) with Infinispan to provide a web-ready RESTful data grid. Recently I (Michael) spoke to Manik about an interesting use case, and he indicated great interest in such a server. It wasn't a huge amount of work to do the initial version - given that JAX-RS is designed to make things easy. For those that don't know: RESTful design is using the well proven and established http/web standards for providing services (as a simple alternative to WS-*) - if that still isn't enough, you can read more here. So for Infinispan that means that any type of client can place data in the Infinispan grid. So what would you use it for? 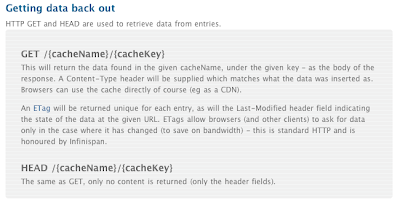 For non java clients, or clients where you need to use HTTP as the transport mechanism for caching/data grid needs. A content delivery network (?) - push data into the grid, let Infinispan spread it around and serve it out via the nearest server. See here for details on using http and URLs with it. In terms of clients - you only need HTTP - no binary dependencies or libraries needed (the wiki page has some samples in ruby/python, also in the project source). The server is a module in Infinispan under /server/rest (for the moment, we may re-arrange the sources at a later date). Currently you can download the war from the wiki page, or build it yourself (as it is still new, early days). This is at present a war file (tested on JBoss AS and Jetty) which should work in most containers - we plan to deliver a stand alone server (with an embedded JBoss AS) Real Soon Now. Questions: (find me on the dev list, or poke around the wiki). Implemented in scala: After chatting with Manik and co, we decided this would serve as a good test bed to "test the waters" on Scala - so this module is written in scala - it worked just fine with RESTEasy, and Infinispan (which one would reasonably expect, but nice when things do work as advertised ! ).